Tour lasts approximately 14 hours. 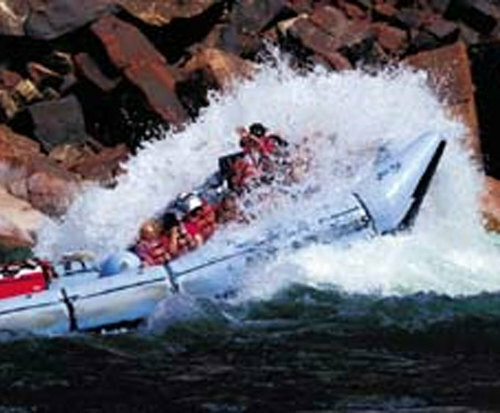 Whether you're an adventurer by heart or someone who is looking for the very best way to experience the Grand Canyon, this guided White River Rafting tour is the perfect combination of scenery and adrenaline to suit anyone's needs! This full day tour gives you unforgettable views of the Oak Creek Canyon, takes you to the Hualapai Indian Reservation and on a 5-hour rafting tour, and let's you enjoy a picnic style lunch on the banks of the Colorado River before lifting you out of the canyon in a helicopter to freshen up and shop for souvenirs. 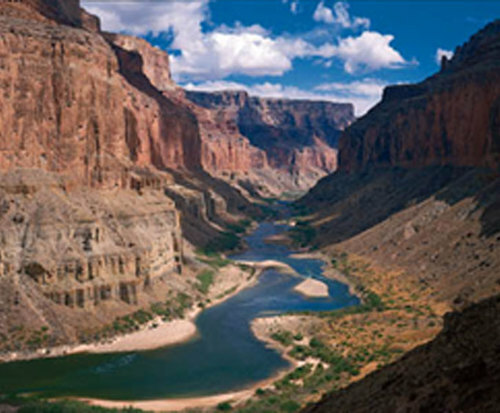 Your tour will be guided and narrated by a professional Hualapai guide who is well-versed in the local flora and fauna, and will be able to tell you informational facts and fun trivia about the surrounding canyon walls, wildlife, and history of the Grand Canyon as you pass through it. Begin your tour by navigating through Oak Creek Canyon and the Ponderosa Pines of Flagstaff before passing through Historic Williams on your way to the Hualapai Reservation, listening to informative facts and stories about the area from your guide. Keep your eyes on the lookout for wild donkeys that call the canyon their home, as well as other local wildlife and plant life that create a surreal, picturesque view you have to see to believe! After boarding your 8-passenger, motorized raft, you will experience Class II-IV rapids on the Colorado River and take a short hike to the Travertine Falls. Keep an eye out for local creatures like Blue Heron as you make your way back and enjoy lunch on the banks of the Colorado River before hopping back on the raft and heading out again! The second stretch of your rafting experience is more relaxed, allowing you to take in more of the scenery as you wind through the canyon. Look up at 4,000 foot cliff walls and keep an eye out for falcons and big horn sheep that are native to the area as you make your way down the river. 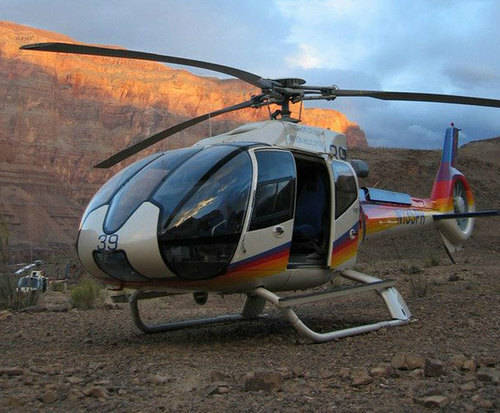 As your rafting journey comes to an end, take to the air and see the canyon as only the local birds do on a brief helicopter ride that takes you to the rim of the canyon. Freshen up at the Airport and shop for the perfect souvenir before heading back to your starting destination. On the way, you are able to nap, relax, watch a video played in the coach, or watch the Arizona scenery pass by through the windows of the vehicle as you reminisce about your fantastic full day tour! Recommended Attire - Weather in the Grand Canyon can vary greatly depending on your location, from pleasant to extreme heat exceeding 100 degrees. It is suggested that you dress for the weather on the day of your visit, and wear comfortable shoes and attire that will support you throughout the day. Hats, sunscreen, and a light jacket are recommended as well. Visit to Oak Creek Canyon and Hualapai Reservation. Lunch on the bank of the Colorado River. Helicopter Ride at the end of the day. Professionally guided and narrated tour.